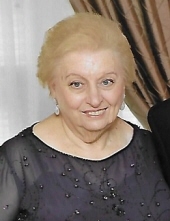 Natalie Markiewicz (nee Zmuda) of Cherry Hill, formerly of Camden, NJ, died November 9, 2018. Age 84. Beloved wife of Edmund S. Markiewicz of Cherry Hill, NJ. Loving mother of Nancy Markiewicz of Berlin, NJ. Dear sister-in-law of Eleanor Zmuda of Audubon, NJ and Barbara Hill (John) of Sewell, NJ. Dear sister of the late Alvin Zmuda. Also survived by many nephews and a niece. Viewing Wednesday morning 9 to 10:45am in The Catholic Church of St. Mary, 2001 Springdale Rd, Cherry Hill, NJ 08003. Mass of Christian Burial Wednesday 11am. Interment St. Joseph's Cemetery, Blackwood, NJ. In lieu of flowers donations in her memory may be made to MD Anderson Cancer Center at Cooper, 900 Centennial Blvd, Voorhees, NJ 08043. To send flowers or a remembrance gift to the family of Natalie Markiewicz, please visit our Tribute Store. "Email Address" would like to share the life celebration of Natalie Markiewicz. Click on the "link" to go to share a favorite memory or leave a condolence message for the family.